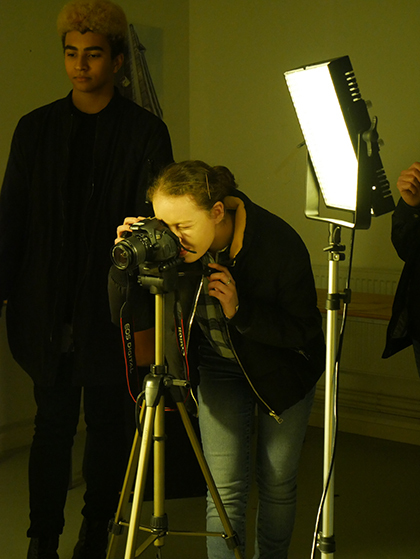 Photography students at The Sixth Form College, Solihull got a taste of commercial photography work this week with a live brief for a real client. Coffee roaster and barista Bartosz Ciepaj came into College with his product and asked students to take some promotional photographs of his product called Molecular Coffee. Professional, local photographer Steve Carse was also present to pass on tips and advice to the students. The live brief started with a presentation to students, followed by the photoshoot itself in the College’s Photography Studio. With the use of high quality cameras and specialised lighting, the students worked with the professional photographer to set up the shots of the coffee, using the product itself and various appropriate props. They learned about manipulating the settings on the camera and the use of the lights to get the best shots possible.